I absolutely love this time of the year and the minute September hit the bright pinks and oranges were out the window and I replaced them with much deeper berry hues. This is definitely reflected in this months favourites. So let's start with the skincare item. I don't usually invest in high end skincare so when I won a giveaway including lots of skincare I was very excited. I've wanted to try the Alpha H Liquid gold forever and I'm glad to say it definitely lives up to the hype. I've been using it once every two days and I've found it's really improved the general texture of my skin. I have also found that it's reduced the amount of blemishes I've been getting. Next up we have Nicole by OPI - Party bus I picked this up from TKmaxx so I'm not 100% sure if you can pick it up from stockists however I gave it a quick google and you can pick it up from Amazon and Ebay. It's a mixture of large and small chunks of silver glitter and I've literally worn it constantly all month. So onto the makeup first off I have the Maxfactor Cream puff blush in Gorgeous berries I picked this up when these blushes first came out and I didn't use it at all for ages as they came out at the start of the summer however since we moved into September I've probably worn it at least half the days I've worn makeup this month. It's such a pretty shade and it leaves a really beautiful healthy glow on the cheeks. For lips I've been wearing Mac Brick'o'la a lot. It's an amplified finish which is definitely my favourite finish from Mac. 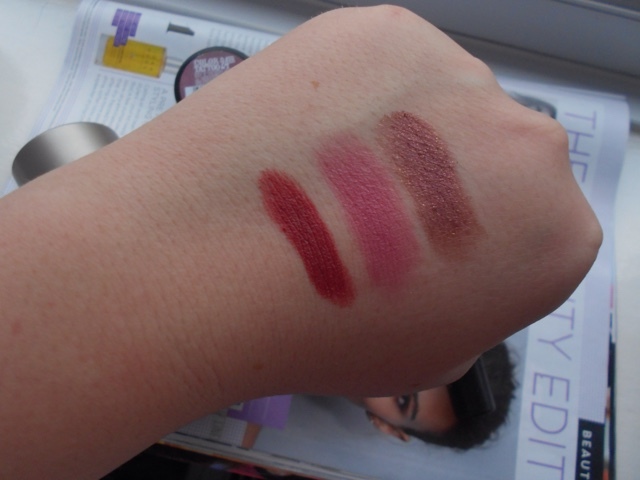 It's a mix of red and terracotta and it's a perfect dark but quite neutral lip which is perfect for everyday. I really don't think this gets as much hype as it should do and I'd highly recommend it to everyone! 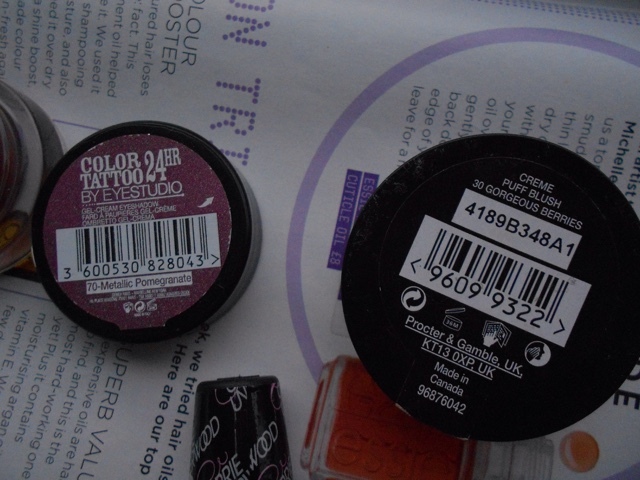 Finally for this months favourites is Maybelline's Metallic pomegranate colour tattoo I love the colour tattoo's and you will know that if you are a regular reader. This shade is quite a neutral burgundy shade it has a lot of brown in it which I love as it means I can wear it everyday without feeling to overdone. I'm utterly in love with the Colour Tattoo's and haven't yet seen this shade but it's gorgeous - perfect for A/W. I love Liquid Gold! The Max Factor Creme Puffs are lovely too, I don't have that shade but have a few others and love them! That glitter nailpolish looks good! Reminds me of the little note on my to-do list: I want an awesome glitter nailpolish too. X! 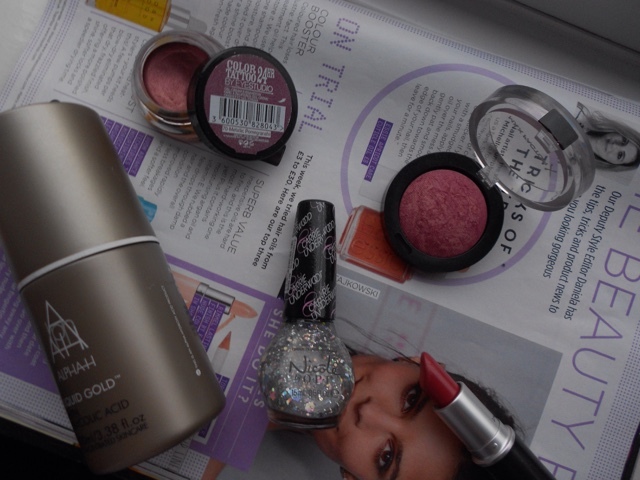 I've had my eye on the Maybelline Metallic Pomegranate for a while - it just looks like the perfect autumn eyeshadow!! I truly love the Color Tattoos but haven´t seen this shade around yet. I need to get into town and hunt it down because it´s gorgeous. This could make an easy everyday eyeshadow but could also be built up for a night out, so it´s just perfect. Thanks for introducing me to this.